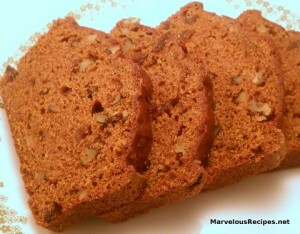 This is a wonderful bread to serve at breakfast or brunch. I enjoy it best slightly warm with my morning coffee. 1. In a large bowl, combine pumpkin, eggs, oil and water; mix well stirring by hand. Sift together the pumpkin pie spice, baking powder, baking soda, salt, sugar and flour. Add the flour mixture to the pumpkin mixture a little at a time blending well after each addition. Stir in the raisins and nuts. * You may use 1/2 cup of oil and 1/2 cup of applesauce instead of the 1 cup of oil, if desired. ** This bread freezes well. Just wrap in plastic wrap then put into a zipper seal freezer bag.